The Spec Ops Tactical Soft Shell Jacket is made by Rothco and keeps you warm and dry with its 3 layer construction. The outer shell makes it windproof and waterproof to protect you from the elements and gives you the comfort of stretch. A breathable fleece lining wicks away moisture and maintains a level of comfort you would expect from a full featured jacket. There are 9 pockets that will give you plenty of storage including convenient arm and forearm pockets for notes or small items. The Rothco special ops soft shell jacket has been a staple for both LE type uniforms and civilian use. It’s durability comfort features and sleek design made this a top pick. One of our most popular jacket styles is the tactical soft shell and it remains a favorite for the staff. Soft-shell jackets were designed to be less bulky and resist water and wind making it perfect for every day use. The outer fabric is breathable, stretchable, waterproof and moves with you and the inside is backed with comfortable fleece to hold in warmth. It feels and looks bombproof. For extra venting, use the under arm zipper to keep you from getting hot when moving. This is a key to regulating your temp so that you do not sweat. The hood has an internal shaped brim with adjustable straps and cord locks allowing you to pull the hood back off your face for better visibility, or draw it in during heavier weather. When it's not in use, the hood packs back into the collar and stays out of the way. There are 2 vertical zippers in the lower back that open to each other giving you extra storage space to roll up fleece, gloves, or run a duty belt. We like the 2 way front zipper that help when you sit down so that jacket does not bunch and gives you easy access to your pant pockets. The tactical soft shell has a clean look and can be worn as a full on tactical, uniform or everyday jacket. We are always a fan of sleeve pockets to stash note pads and handy stuff. There is also hook and loop on the arm for a flag, moral or unit patch. The fit is close to the body (not tight) and waist length. 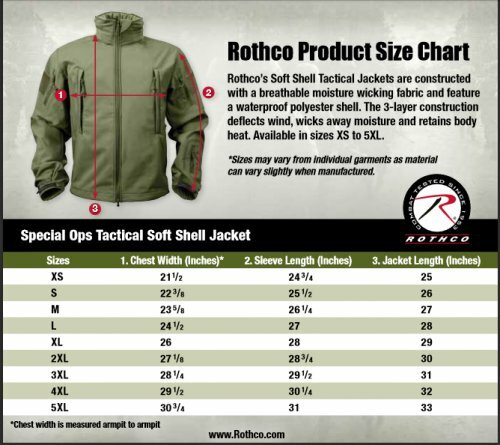 WHY CHOOSE ROTHO'S TACTICAL SOFT SHELL? If you need a casual every day waist length jacket that will work well in both cold and wet weather this is a great option. It can be worn casually or as a uniform and takes a beating for years. The look is modern, sleek and sporty. The fit is true to size and meant to be close to your body. The length comes just below the waist. Machine washable hang dry. Warning: Products on this site may contain chemicals associated with State of California Proposition 65 warnings. Significant exposure to these chemicals is known to the State of California to cause cancer, birth defects or other reproductive harm. For more information go to www.P65Warnings.ca.gov. Click the button below to add the Rothco Special Ops Tactical Hooded Soft Shell Jacket to your wish list.